305km of Cycle Network, You Kidding? A draft of Glasgow’s Strategic Plan for Cycling 2015 – 2025 has just been released by Glasgow City Council (GCC) for comment (http://bit.ly/1fewH91) and, being of the cycling persuasion, I did not need to be asked twice. So yellow marker in hand (digital variety of course) I set forth to give it a review. I would like to say that I have completed my critique but I am afraid that my thought processes have stumbled before getting past the introduction. Let me explain. The very first diagrams in the introduction are a pair of graphs. The upper shows the number of cyclists to/from the city centre for the years 2007-2014, the lower the shows the length in kilometres of Glasgow’s cycle network for a similar period. Happily both show nice positive trends and the implication is clear, increased kilometres of cycle network leads to more cyclists. 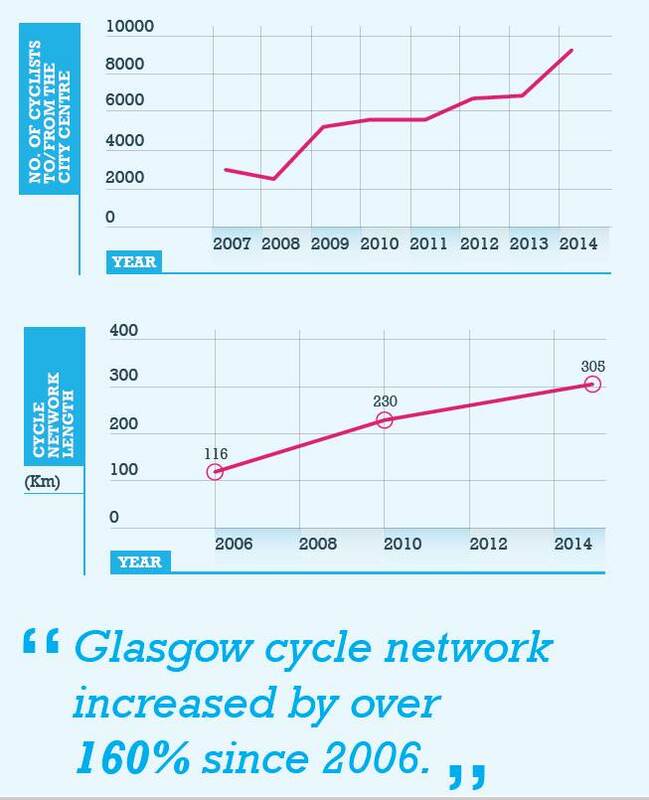 This message is reinforced by the large caption “Glasgow cycle network increased by 160% since 2006”. Ah, I hear the more cynical of you say, evidence of correlation is not evidence of causation, and I applaud your caution. To deconstruct these diagrams let’s look at what GCC means by cycle network, for which it claims to have 305km in 2015. Let’s be fair to GGC, deciding what is part of a cycle network is down to definition. So what does GCC define as cycle network? 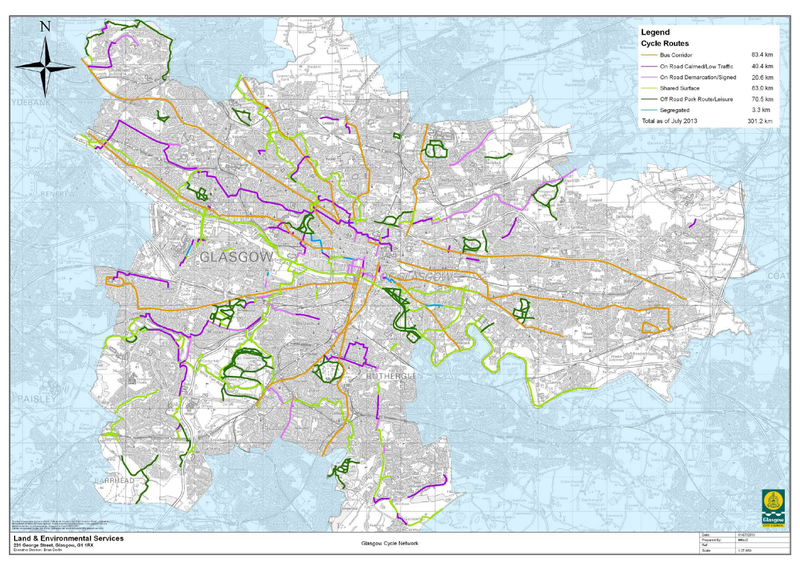 The most recent GCC document I have seen depicting Glasgow’s cycle routes is dated 2013 and gives Glasgow’s network as 301km (http://bit.ly/1JRLXoU). Does it convince me that we had 301km of cycle routes in this year? In a word, “no”. In fact I might go as far as to say that the number 301km is fanciful when you look at the categories. Let’s consider the “off road park route/leisure” routes first. These include all the small paths within Glasgow’s parks and there is almost no path too small or too muddy for exclusion from this category. The 2013 map clearly figures paths in Pollok and Linn Parks which are virtually impossible to cycle. More importantly, Glasgow’s “Management Rules Regulating Public Parks” (shown at every park entrance) stipulate that all vehicles, including cycles, must be ridden at a maximum speed of 5mph. I don’t know about you, but I find it near impossible to consistently cycle so slowly. We should thank the city fathers of the 19th and 20th century for creating these walking routes. We are now allowed to (very slowly) cycle on them but it’s ludicrous for GCC of the 21st century to claim them as additions to the cycle network. What about “bus corridors”? On one level one can cavil at a route that places cyclists in the same lanes used by professional drivers with schedules to maintain, but on the other hand, if the lanes were not there, cyclists would not only be sharing the routes with the buses and taxis, but all the other vehicular traffic. Arguably some benefit therefore accrues to cyclists. So 83.4km then? Not so fast GCC. 83.4km is indeed the length of the bus corridors, but what is not so well understood is that bus lanes only constitute a fraction of a total bus corridor, For example, the Maryhill bus corridor is 5.3km in length, but bus lanes are only in place for 25% of the total length. Large sections of Maryhill Road are full-on dual carriageway, but every kilometre of bus corridor is entered by GCC into the Cycle Network. Examination of other bus corridors on GoogleEarth similarly shows that large sections are devoid of actual bus lanes. Short of measuring every meter of actual bus lane it’s hard to determine the exact fraction of bus lanes in the bus corridors, but a value of 25% is going to be approximately correct overall. So, dear reader, what do you think? Is it reasonable that every kilometre of bus corridor is assigned into the category of Cycle Network or would perhaps a number nearer 21km be more accurate? The “on road demarcated/signed category” (20.6km) is also dubious. What does this mean other than some white paint has been put down and signs erected saying “cycle this way”? Similarly for “on road calmed/low traffic” (40.4km). Almost no money has been spent on these and yet they are touted as evidence that the council has been fulfilling the needs of wants and needs of cyclists. Consideration of the “shared surface” class (83.0km) of the Cycle Network has a happier outcome. Some of these paths are actually quite good and include pleasant routes such as the Kelvin Way, the Clyde Walkway, the NCN7 to Balloch and the Forth and Clyde Canal. Other routes in this category are less attractive and comprise footpaths designated as shared use next to main roads. As a general statement, however, nice as these routes can be, the key word is “shared”. If you are going out for an afternoon’s ride they are great. If you are trying to go somewhere to a schedule they are poor as you have to negotiate with people on foot, and as any cyclist will tell you, dogs have little understanding of how to stay to the side of a path to let a cyclist by. This just leaves the “segregated routes” and arguably only these, all 3.3km of them as of 2013, can be counted as true cycle routes. 3.3km is better than none but given that Glasgow has a total of about 2000km of roads, it does show that we have a very long way to go. I said at the outset, what constitutes the Cycle Network is open to definition but in my opinion GCC have pushed the definitions far beyond their natural limits. I suggest that only the following can truly be included into Glasgow’s Cycle Network: ~25% of the bus corridor (21km), the shared surface routes (81.0km), with the caveat that they are mainly leisure routes, and the segregated routes (3.3km). The on road calmed/low traffic/calmed/low traffic routes are not necessarily bad to cycle, some are fine, but when you look at the actuality, they are just roads and not of sufficient status to be truly included as part of a cycle network. As a double check on my total network number of 105.3km, OpenStreetMap independently gives a total of 89km, which interestingly is referenced by GCC on their Open Data pages (http://bit.ly/1GKdlmr). Do they not believe the 305km number themselves? This brings me back to my original concern about the juxtaposition of the two graphs showing the apparent year-on-year increase in the cycle network and number of cyclists going in/out of the city. If the length of cycle network is erroneous then the increase in cycle numbers is a result of other factors, and the increase has happened despite, rather than because of, efforts by GCC to improve cycle facilities. So, GCC, nice try at a bit of spin, but no cigar. Now I have that clarified, I will now set forth again to review the draft consultation. Bus corridor – as you discuss, this includes roads with bus lanes and the generally the rest of the same roads even though there are no bus lanes on the other bits, but it also includes roads such as around South Baillieston and Penilee where the buses go around the houses on residential roads, with little more than raised kerbs and bus stops and nothing for cycling. On Road Calmed/Low Traffic – stunningly includes the whole of the Colleges Route, which fits better in the Demarcation/Signed category. Some of the routes shown (Haghill, Riddrie, Hillington) have no indication on the ground that they are cycle routes of any kind. On Road Demarcation/Signed – generally seems correct, except for Mosspark Boulevard along the side of Bellahouston Park which is shared use footway. Shared Surface – mostly off-road paths, but a large chunk of this category is shared use footway along roads, which are largely ignored by most confident cyclists, even those (like me) that would prefer an off-road route. This appears to include some routes though parks (Pollok Park) and not others (Glasgow Green, Bellahouston Park), although there are also some random parks within Bellahouston Park that are shown as this category. Most of the main part of the Forth & Clyde Canal is omitted, only the Glasgow Branch and a little of the mainline around Maryhill is shown. The White Cart route through Newlands and Cathcart is shown as this category, when much of it is on road (mostly low traffic). Off Road Park Route/Leisure – as you say, most paths in parks. Not sure what the point of this is, because it results in a mix of paths that are useful (e.g. across parks) and those that are not (parks where every path is shown e.g. ornamental paths around flower beds, fountains, etc). However, Robroyston Park contains many more listable paths than are actually shown. Segregated – Moss Road is shown (that was recently [since 2013] converted to one wide shared use path), but not the Clyde Tunnel (which despite the council’s plans, remains segregated). I absolutely agree about the Off Road Park Route/Leisure routes. These are mostly just a collection of random paths in parks and make no contribution to a joined-up “network”. Don’t forget that according to the “Management Rules Regulating Public Parks” that all vehicles, including cycles, must be ridden at a maximum speed of 5mph on these paths. Bravo. Far more convincing than GCC’s fanciful assertion. I was wondering where they got that number from. Great work, Sherlock. Excellent post. I’d say you’re still being generous by counting any bus lane as being part of a cycle network – if it isn’t suitable for 8-80, it shouldn’t be counted. I’ve cycled along the bus lanes on Paisley Road West and certainly haven’t felt comfortable. I wonder who actually benefits from this odd council policy of lying to themselves (and the public). Anyone in Glasgow would know that it’s nonsense, what purpose does it serve? Reminds me of when a Renfrewshire councillor stated in a press release that ‘We [Renfrewshire] have an excellent network of cycle paths.’ It’s clearly nonsense, so why say it? I think it is also important to realise that many of the lanes which are painted on the road are often more dangerous than having nothing at all. If the cycle lane wasn’t painted on the road in the first place, I feel there’d be less pressure to use the most dangerous part of the road. Finally, I find that even on the painted lines that are not in the door zone (for example, most of the A77 south of Giffnock) aren’t well maintained, meaning that there are sunken drains, potholes and debris galore. Next Next post: Oswald Street, Really?